Image Location: La Cañada, Ávila, Spain. Image credit: Juan lacruz via Wikimedia Commons. Public domain. Open landscapes of mountains, plateaus and steppes. Sea level to high elevation. Generally absent from densely populated or agricultural areas. Protected in the U.S. under The Bald Eagle and Golden Eagle Protection Act. Aerobatic flyer. Glide and soar; able to make steep dives. Walk and hop. Diurnal. Perch much of the day. Hunt, incubate, and build nests. Largely solitary, except for breeding birds. May roost or bathe in groups. Immature birds may associate with each other. Carrion, medium-sized mammals (mustelids, foxes, cats, young of large mammals), birds, less often reptiles. Between 66 and 75 days. Is the national bird of Mexico, Albania, Germany, Austrian, and Kazakhstan. Formerly occurred in the Appalachian mountains of eastern U.S. In winter and early spring, defend territories with undulating "sky dance"
Sometimes hit by wind turbines. © 2011-2018 San Diego Zoo Global. Population Status update 2016. Minor update to taxonomy Sep 2018. 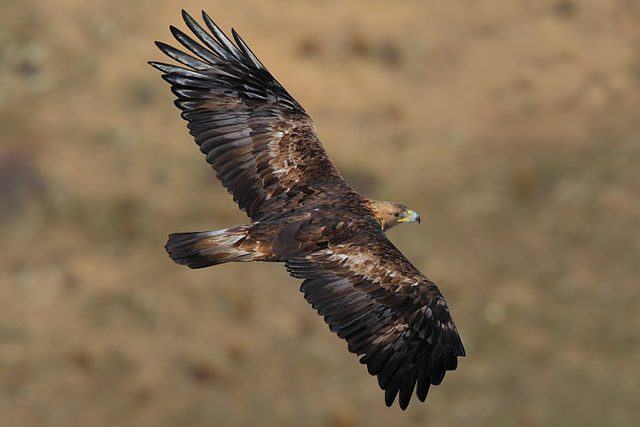 How to cite: Golden Eagle (Aquila chrysaetos) Fact Sheet. c2011-2018. San Diego (CA): San Diego Zoo Global; [accessed YYYY Mmm dd]. http://ielc.libguides.com/sdzg/factsheets/ goldeneagle.